French energy company is partnering with business consulting group Maltum to launch a brand new blockchain development spin-off. Dubbed as Blockchain Studio, it is designed specifically for commercial clients. It is expected to target clients in both Asian and Southern Europe regions. According to a press release, the product is basically a software suite meant to accelerate and industrialize the implementation of all blockchain projects. “Most blockchain projects stagnate at the ‘proof of concept’ stage and this technology still remains the domain of experts and specialists,” the company stated in its release. The tools will be used in helping develop smarter contracts. More importantly, Blockchain Studio will be easily accessible to users who have no technical knowledge whatsoever. Ultimately, it will help in managing the establishment of a blockchain infrastructure, allowing it to be accessible either on the cloud or directly on the company’s own server. Ripple’s general counsel Brynly Llyr first joined the company in 2016 as a top legal officer. Now, she is reportedly stepping out of the blockchain payment startup. Although the firm did not release any information detailing her departure, a spokesperson of the company explained that it was merely a “mutual decision” between her and the startup. Prior to joining the company, Llyr was known for providing support to fintech companies. She was also responsible in spearheading litigation teams while partnering on matters involving commercial deals. PayPal and eBay were among the top companies mentioned on her resume. Llyr’s departure comes as Ripple prepares to battle several class-action lawsuits, all of which claim that the XRP token is a security distributed directly by the company. Yoon Suk-huen is the official from South Korea’s Financial Supervisory Service (FSS) who wants maximum global cooperation between crypto regulators and Initial Coin Offering (ICO) regulation. Being a governor of FSS, he explained the interesting potential of having greater cooperation during the opening ceremony of the 20th Integrated Financial Supervisors Conference (IFSC), which was held in Seoul. The official also went to suggest that the country’s main goal is to significantly improve transparency in every transaction, as it can help in preventing illegal activities. He even urged the need for coordination on a global scale, one of which includes sharing of information among countries. The volume of trade in the crypto market reached $11.27 billion. The market’s capitalization, on the other hand, sat at $192.16 billion. In the past 24 hours, Bitcoin fell 4.14% to trade at $6,221.19. The leading cryptocurrency’s trade volume trickled to $3.86 billion, while its market slid to $107.36 billion. Ethereum’s price fell 11.93% to trade at $191.53. As for the altcoin’s trading volume, it reached $1.62 billion; whereas its market capitalization hit $19.51 billion. In the past 24 hours, all prices were down. Meanwhile, Monero dethroned DASH at the 10th spot. Bitcoin’s market price fell 4.14% to $6,221.19, and its value in the market is $107.36 billion. Ethereum’s market price fell 11.93% to $191.53, and its value in the market is $19.51 billion. 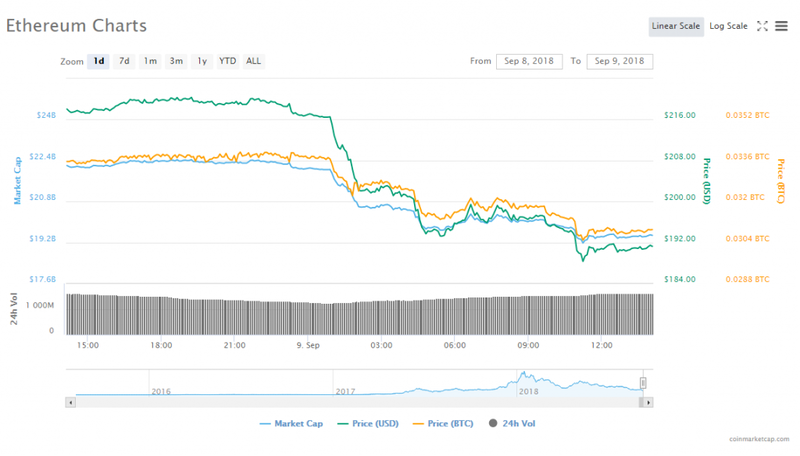 XRP’s market price fell 5.42% to $0.277837, and its value in the market is $11.02 billion. 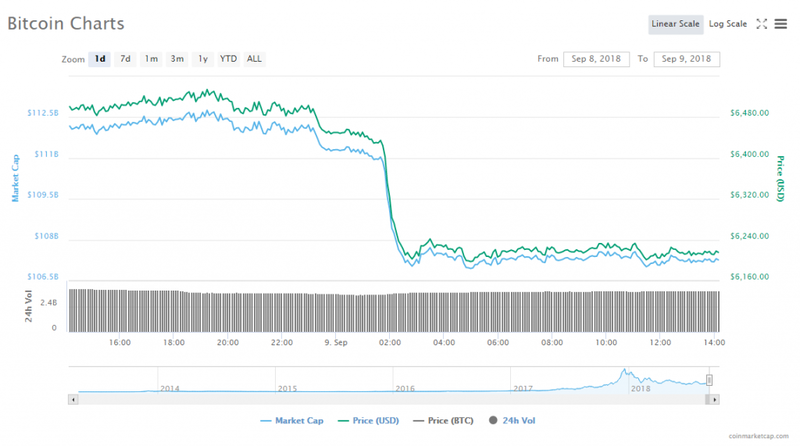 Bitcoin Cash’s market price fell 6.72% to $470.21, and its value in the market is $8.15 billion. EOS’ market price fell 6.55% to $4.76, and its value in the market is $4.32 billion. Stellar’s market price fell 6.18% to $0.193873, and its value in the market is $3.64 billion. Litecoin’s market price fell 6.46% to $52.91, and its value in the market is $3.08 billion. Tether market price fell 0.12% to $1.00, and its value in the market is $2.76 billion. 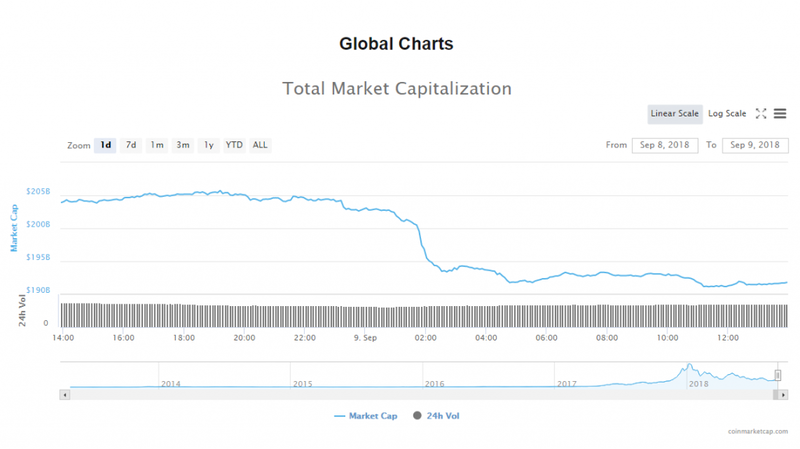 Cardano market price fell 9.91% to $0.075908, and its value in the market is $1.97 billion. Monero dethroned DASH at the 10th spot, with its market price falling 8.44% to $103.91, and its value in the market is $1.7 billion. According to two of the latest patent filings, it seems that Microsoft is exploring the option of using TEEs (Trusted Execution Environments) for its Blockchain offerings. According to the data gathered by the US Patent and Trademark Office last week, a TEE is something that stores a pre-determined kind of Blockchain or protocol code within a validation node. Cryptocurrency merchant bank Galaxy Digital reported its first quarter for this year. Mike Novogratz’s firm posted a $134 million loss in this time. The company cited a slumping cryptocurrency market as the reason for its poor performance. Coil is a new company founded by the former chief technology officer of Ripple named Stefan Thomas. Now, it has finally entered a closed beta. The project reportedly aims to enable web content creators to better monetize their work.